Bio-Pure®Freeze Tubes are manufactured from polypropylene to withstand temperatures to -80 °C. Tubes can be color-coded with inserts. 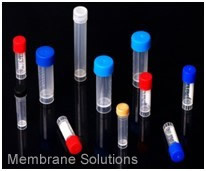 All self-standing vials have a special base design allowing them to be locked into the cryogenic rack and tray, for single-handed manipulation. 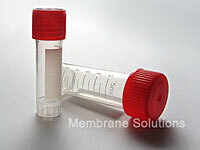 Freeze Tubes are ideal for sample processing application for small volume sample. Excellent for cryo storage or secure sample handing. Excellent quality PP or GPPS tube body and PE cap. Available with 3 volume of 1.5, 1.8 and 5.0mL. ;Ideal for small volume samples. Screw cap with plug seal for one-handed operation. Easy-to-read graduations are accurate to ±2%. Gamma irradiation sterilized; Certified endotoxin-free. Packaged in easy-to-open plastic bag to assure sterility.